Burton Holmes was a mega star of his day; for sixty years he was America's most famous travel showman. 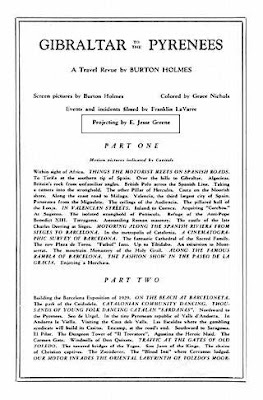 The Burton Holmes Lectures, based on the slides and his narrations for them, were presented at Carnegie Hall in excess of 450 times. Holmes' lectures at Carnegie Hall were accompanied by stereoscopic presentations operated by a young man named E. Jesse Greene (my grandfather). 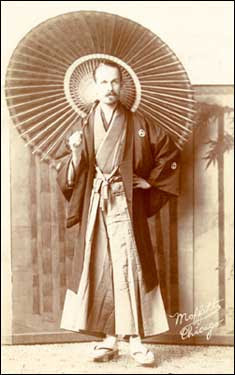 Jesse had joined Holmes and his group of travelers right out of high school. He could have received no better education. Holmes taught him everything he needed to know about photography and when Burton Holmes Inc. switched to film Jesse became a film editor (one of the films Jesse edited, Seeing London (ca. 1920s) can be found here). Impressed with Jesse's work was the superintendent of Carnegie Hall, Louis Salter (my great grandfather). 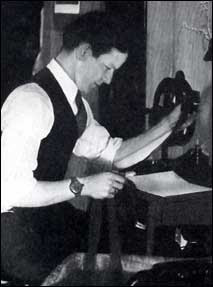 Salter spoke with Jesse about doing some work as a projectionist for Carnegie Hall while he was in New York with Burton Holmes. 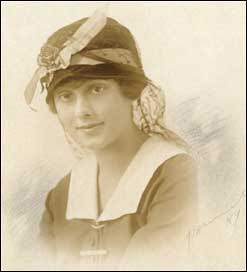 Salter must have been very impressed with Jesse, because he soon allowed the young man to begin courting his only child, Lillian (my grandmother). The courtship lasted three years. 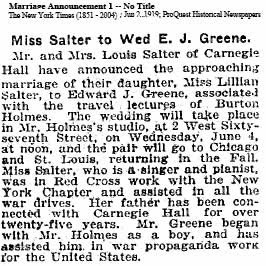 The Salter's announced the upcoming marriage of their daughter Lillian in the New York Times on June 2, 1919. Following the wedding, the formal announcement of the marriage was sent to friends and family. 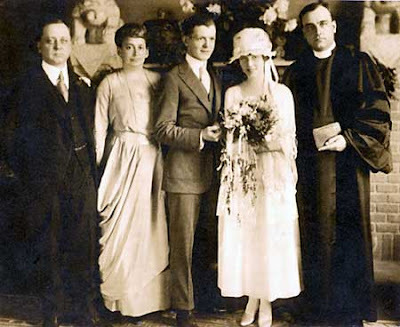 Weddings in New York City during the early 1900s were most often held in the home of the bride's parents. 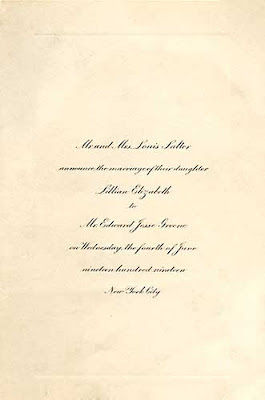 As the Salters lived in Carnegie Hall, other wedding arrangements had to be made for Jesse and Lillian. Burton Holmes offered his New York Studio "Nirvana" to the young man of whom he had become so fond. This was a wonderful gift from Holmes to the young couple. 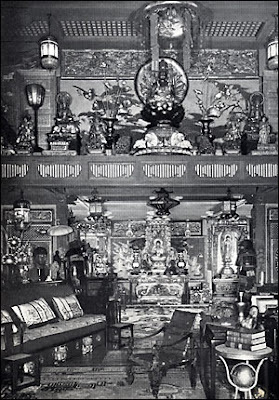 "Nirvana" was a famous New York studio and gathering place for the elite that were Holmes' friends and associates. Of Nirvana, Holmes is quoted as saying, "I call this place Nirvana, my Oriental heaven in the center of New York. You haven't met Louise, our housekeeper. She calls it Budapest. She has to dust the place." "Nirvana" was a duplex with fourteen rooms on the top two floors. The building faced West 67th Street, and commanded magnificent views over Central Park, especially at night when the tall buildings of New York City on the south side glowed with thousands of lights. This must have been a very exciting place in which to be married. The Drawing Room - "Nirvana"
It is believed that the wedding party photograph was taken by Holmes himself and was another generous gift to the bride and groom. 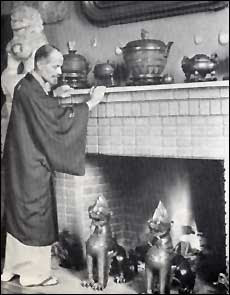 You can see the same fireplace pictured in the wedding photograph in this photograph of Holmes taken for a biography he had written about himself. Following the wedding the bride and groom took several months to tour St. Louis and Chicago. 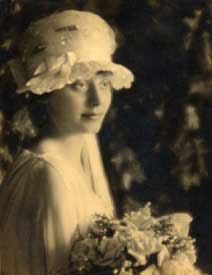 It is believed the newlyweds visited Holmes in his Chicago studio during their honeymoon trip. Jesse and Lillian maintained a close friendship with Holmes until his death. When the honeymoon was over the couple returned to New York to live with the bride's parents. This is one of those missed opportunities I regret. I never spoke to my grandmother about her wedding. I wish I had. I am, however, fortunate enough to have some facts and photographs to be able to piece together the event. This article was written as a submission to the 33rd Edition of the Carnival Of Genealogy (COG), with the topic of "Family Wedding Stories & Traditions." This Carnival is hosted by Creative Gene. 1. Holmes, Burton. The World Is Mine. Culver City, California: Murray & Gee, Inc., 1953. 2. Soule, Thayer. On the Road With Travelogues: 1935 - 1995 A Sixty-Year Romp. Authorhouse, 2003. Direct quote. 3. Stoddard, Lothrop. Burton Holmes and the Travelogue. Philadelphia: George F. Lasher Printing Company, 1939. 1. Burton Holmes Extraordinary Traveler, The Traveler's Rest: Home at Nirvana and Topside, (http://www.burtonholmes.org/: 6 July 2007), unknown author entry. 2. 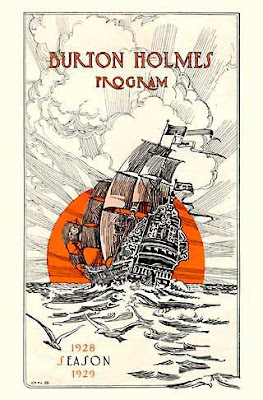 Internet Archive, Seeing London (ca 1920), (http://www.archive.org/details/SeeingLo1920), Burton Holmes entry. 1. All photographs and documents in possession of the author. Wow! What a great story fM. And to be able to document it with so many pictures is absolutely wonderful. I really enjoyed reading this article. But then, I enjoy reading all of your articles. Great work! What a lovely story! I enjoyed seeing the detail on your grandmother's wedding dress, right down to the cute hat! What an interesting story. Love the pictures. One of the things I regret about family history is not getting bitten by the bug sooner. So many family stories have been lost because the grandparents and older relatives are no longer around to tell the tales. Thank you everyone, I'm so glad you enjoyed the story. Short on story long on photographs. One side of my family has tons of photographs and no stories documented. The other has stories and no photographs. As Becky said, there are so few older relatives around to tell the tales or save the photographs. If only I had asked more questions! Great story and well-illustrated (and documented)! Miss Maven, I am swept back in time to those high society events those of us in the "fly over" states can only read about! What a wonderful set of documents/photos to "tell" the story of your grandparents and what a wonderful job you've done letting their story tell itself. Thanks. In the genealogy certificate program I attended we had a magnificent instructor/historian who demonstrated making whole cloth (a story) from scraps (photographs, newspaper articles, documents, etc. of the time). I'm just learning this process. My instructor was a master and kept me entralled and engaged in every one of her classes. Thank you Lorraine! I have found it isn't as easy as it looks. You certainly make it look easy! It reads like a wonderful fairytale.